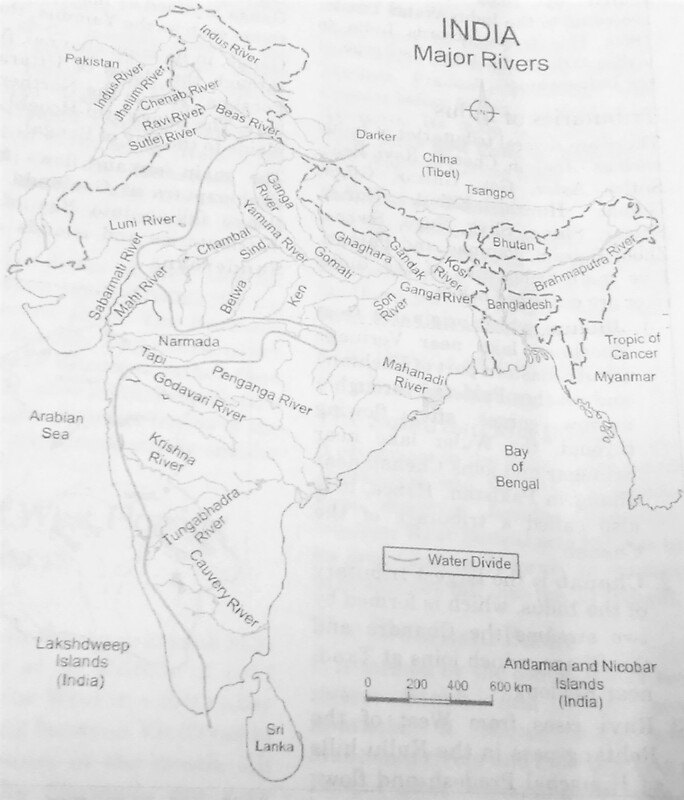 Some rivers of India do not reach upto the sea and constitute inland drainage. These rivers are mostly present in the drier regions of the country like Western Rajasthan, Ladhakh and Aksai Chin etc. Gaggar River is the most important example of inland drainage. It is a seasonal stream rising from the lower slopes of Himalayas and is said to flow on the dried bed of ancient river Saraswati. It forms boundary between Punjab and Haryana for much of its length and gets subsumed in Rajasthan desert. Another Such River is Luni, which is the larger river of Rajasthan. It originates near Pushkar and flows South-west of Aravallis till it reaches Rann of Kutch. The Drainage systems of India are mainly controlled by the broad relief features of the sub-continent. Accordingly, the Indian rivers are divided into two major groups the Himalayan rivers and the Peninsular rivers. The major rivers originating from the Himalayas are the Indus, the Ganga and the Brahmaputra. These rivers are long and are joined by many large and important tributaries. Most of them are perennial, i.e. they have water throughout the year. These rivers receive water from rain as well as from melted snow from the lofty mountains. The two major Himalayan Rivers, the Indus and the Brahmaputra originate from the North of the mountains making gorges. The Himalayan Rivers have long courses from their source to the sea. They perform intensive erosional activity in their upper courses forming V-shaped valleys, rapids and waterfalls. In the middle and the lower courses, these rivers form flood plains, meanders, oxbow lakes and many other dispositional features. They also form deltas at the mouth of the river. The river Indus is the westernmost of the Himalayan Rivers in India. It has been the cradle of one of the oldest civilizations of the world. It rises from a glacier near lake Mansarovar and flows 709 km in India with a total length of 2880 km. It is known as Singi Khamban (meaning lion’s mouth) in Tibet. After flow n the North-West direction between the Ladhakh and Zaskar ranges, it passes through Ladhakh and Baltistan. It cuts across the Ladhakh range, forming a spectacular gorge near Gilgit in Jammu and Kashmir. It enters into Pakistan near Chillar in the Dardistan region. The water recourses of Indus river system are shared by India and Pakistan according to the Indus Water Treaty, 1960. This treaty accords India to utilize 20% of the total discharge of the Indus waters. 1. Jhelum which originates from Sheshnag lake near Verinage (South-Eastern part of Kashmir) and reaches Pakistan through a narrow gorges after flowing through the Wular lake near Srinagar and joins Chenab near Jhang in Pakistan. Hence, it is also called a tributary of the Chenab. 2. Chenab is the largest tributary of the Indus, which is formed by two, streams the Chandra and the Bhaga, which joins at Tandi near Keylong. 3. Ravi rises from west of the Rohtang pass in the Kullu hills of Himachal Pradesh and flows through the Chamba valley of the state. 4. Beas is another important tributary of the Indus which rises from the Beas Kund near the Rohtang pass. It flows through the Kullu valley and forms gorges at Kati and Largi in the Dhauladhar range. It joins Sutlej near a place called Harike in Punjab. 5. Sutlej originates from the Rakas Lake near the Manasarovar Lake where it is known as Langcher Khambab. It is an antecedent river which cuts through the Himalayas at Shipki la (pass) and enters in India. This System drains a very large area comprising of the Himalayas in the North, Northern parts of peninsular plateau in the South and the Ganga plains in between. As its origin, known by the name Bhagirathi, it is fed by the Gangotri glacier near Gaumukh (3900 m) in the Uttarkashi district of Uttarakhand. It is further joined by the Alaknanda at Devprayag after which it gets the name Ganga. AT Haridwar, the Ganga emerges from the mountains to on the plains. The Ganga is joined by many tributaries from the Himalayas, a few of them being major rivers such as the Yamuna, the Ghaghara, the Gandak and the Kosi. Ganga on its main channel flows for a total length of 2525 km. It flows Eastwards through the slates of Uttarakhand, Utter Pradesh, Bihar and West Bengal till Farakka. This is the northernmost point of the Ganga delta. The river bifurcates here. The Bhagirathi- Hooghly (a distributary) flows Southwards through the deltaic plains to the Bay of Bengal. The main stream flows southwards into Bangladesh to further join with Brahmaputra at Goal-undo. Further down streams, it is known as the Meghna. Before falling into Bay of Bengal, it forms a vast delta consisting of many distributaries and islands and is covered by dense Mangrove forests known as Sunderbans. The river Yamuna rises from the Yamunotri glacier near Bandarpunch (6316 m) also in the Uttarkashi district. It flows parallel to the Ganga and as a right bank tributary, meets the Ganga at Allahabad (Prayag). The Ghaghara and the Gandak rise in the Nepal Himalaya. Both of them bring floods to the Parts of the Northern plains of Utter Pradesh every year, causing widespread damage to life and property but enriching the soil for the extensive agricultural lands. River Kosi also rising from Nepal. Himalayas is known as Sorrow of Bihar. It has this distinction for being notoriously changing its path frequently. It brings huge amount of sediments and as it reaches the Bihar plains, those sediments get deposited blocking the path of the river and consequently, it changes course. Mahananda is another tributary of Ganga rising in the Darjeeling hills. A large left bank tributary Son, originates from the radial drainage Amarkantak Plateau. After forming a series of waterfalls, it joins Ganga at Arrah in Bihar. Damodar River flowing from Chhotanagpur Plateau joins the distributary of Ganga-Hooghly in West Bengal after traversing through Jharkhand. Its valley is known for rich coal deposits. It was once known as the Sorrow of Bengal, but now has been tamed by building dam projects being managed by Damodar Valley Corporation. It is joined by major tributes like Chambal, Sind, Betwa, Ken on its right bank while minor tributaries like Hindaun, Sengar, Varuna join on its left bank. The Chambal rises near Mhow (Military Headquarters of War) in Madhya Pradesh and traverses through Rajasthan to finally join Yamuna at Rajasthan-Utter Pradesh border. It is famous for its badland topography known as Ravines. The Brahmaputra rises in Tibet, East of Manasarovar Lake from Chemayungdung glacier of Kailas range, very near to the sources of the Indus and the Sutlej. It is slightly longer than the Indus and most of its course lies outside India. It flows Eastwards parallel to the Himalayas in Tibet where it is known as Tsangpo. Here, the river carries a smaller volume of water and less silt as it is a cold and a dry area. The Brahmaputra has a braided channel in its entire length in Assam and forms many Riverine Islands most important of which is Majuli Island. Majuli Island is largest Riverine Island of world. On reaching Namcha Barwa (7757 m), it takes a U-turn and enters India, West of Sadiya town in Arunachal Pradesh through a gorge. Here, it is called the Dihang and it is joined by major left bank tributaries- the Dihang and the Lohit to form the Brahmaputra in Assam. Right bank tributaries of Subansiri, Manas and Sankosh join it in its 750 km course through a region of high rainfall and carries a large volume of water and considerable amount of silt. Tista is also the tributary of Brahmaputra.